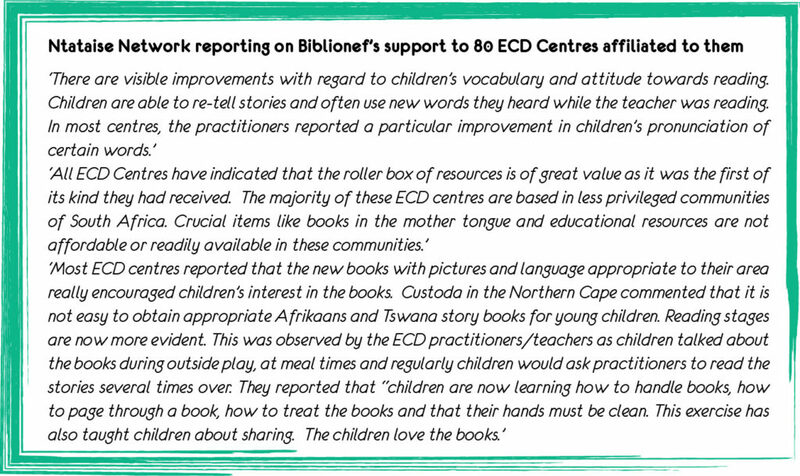 With financial support from Donors, we donate books and educational toys, puzzles and posters to under-resourced Early Childhood Development (ECD) Centre’s and Family and Community Motivator (FCM) Programmes. The FCM Programmes were initiated in response to the many pre-school children not attending ECD Centre’s. The Motivators support and stimulate the child in his/her own home environment and at the same time reach the primary caregiver equipping them with parenting skills, growing their awareness and giving guidance according to their needs. We support ECD Centre’s and FCM Programmes that are affiliated to registered ECD Training Centre’s. In this way, we can ensure that the donated resources will be optimally used for the benefit of the children. ECD Centre’s receive their donation of storybooks and educational resources in a plastic container. This ensures that their resources can be easily stored away and allows for easy access by the children. The Motivators use Biblionef book bags, which contain books and educational material when visiting families and will leave some of it behind for a week so that the families can share it with their children.